United States of America. Act of February 25, 1862. $500 6% Coupon Bond. Hessler X131I. Issued and Redeemed. Very Fine.This is an exceedingly rare, possibly unique, Federal loan certificate. Not only does it have meritorious rarity, it displays a tremendous layout with historic portraits and vibrant color. The layout with Abraham Lincoln and Salmon P. Chase portraits made a powerful political statement to potential investors, particularly foreign investors. This was also issued and redeemed by important Civil War financiers. Fully issued 2nd series bond with nearly all the coupons remaining underneath. Printed on bond paper by the National Bank Note Company. Blazing orange frame encloses obligation, titles, and portraits of Lincoln and Chase; both of whom were very much still alive and very powerful. Under portraits are 500 dies composed of elements from the Durand patents. Orange coupons underneath. Red Treasury seal at upper right and cornered on all coupon faces. Back is brown with lathe pattern behind coupons and 500 protector bottom center. No. 517. Signed by L.E. Chittenden as Register of the Treasury. Issued to Fisk & Hatch who were leading bond buyers and brokers of these loans. Nine coupons were redeemed from the 39 originally affixed. 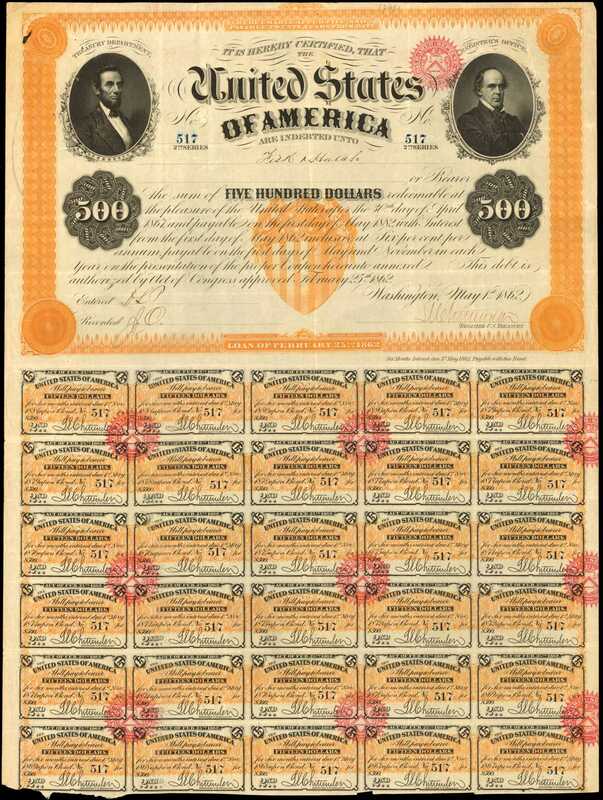 Ink stamping on verso: "Pay Secretary of the Treasury/for Redemption/J & W. Seligman & Co." Seligman firm still exists today, but its role in American finance was perpetuated by multiple brothers and their descendents. They sold United State government loans in Europe in this period. After the war they were involved with American railroads and later the Panama Canal. This is the only example known to us and was obtained at the 1996 CPMX sale by Smythe for $7,150. That was a strong price for any bond certificate 22 years ago. This is one of the finest items from the Herzog collection and worth a runaway price due its rarity, beauty, and Civil War historical context.From the John E. Herzog Collection; 1996 CPMX Auction #148 (R.M. Smythe & Co., February 23, 1996, lot 1043).